Windows 7 discovered with hundreds of errors – Who says Windows 7 is the best? Home page → Computing → Windows → Windows 7 discovered with hundreds of errors – Who says Windows 7 is the best? Being an early adapters of Windows Vista (the most power hungry OS from MS), I continued the trend with Windows 7. It was superb OS before few months ago it was still a public release for evaluation. No hangs, no exceptions and no dunked performance that it’s earlier predecessors were accustomed to. Alas, Microsoft has to pay for Win7. We represent some of the most shocking (as we would like to say) screenshots that would reveal Windows 7 as NOT the best OS as MS has been claiming always. No extra programs have been installed after successfully installing/ running Win7. The exception Privileged instruction, 0x00000096 occurred in the application at location 0x01723361. Is this something that a cockroach hit my motherboard lines or something called Super Administrator exits- since the only user is the Admin. But unfortunately I need to click on OK to terminate the so called program whenever I am shutting down or restarting Win7. This is a persistent windows screen that I have been forced to see as soon as Win 7 was installed. For just a simple computer user NOT the Windows debugger- this is a matter of performance to say hya to Win7. 2. 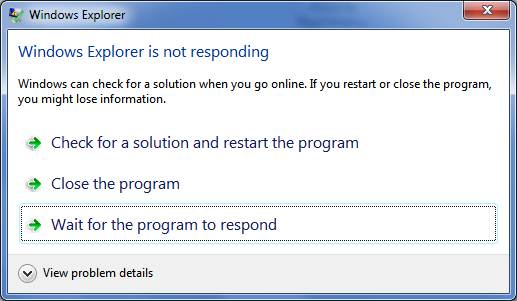 Windows Explorer (Windows 7 Windows Explorer) is not responding. Though with 7 gigs of RAM in Vista I have been experiencing the hanged Windows Explorer, this must be a common phenomenon with Windows 7. In early days of installing Win7, no the run was smooth with no any NOT responding windows. But there might be some bugs with Win7 registration- after which Windows Explorer is crashing each time I boot this 3 gigs RAMed machine from HP. This is a hi-time for Microsoft since they are releasing Win7 in few days to come. There are proofs that no any security related issues (including viruses, malwares or adwares) have been entertained externally from my side. Are they implanting from …. registration or what?? 3. 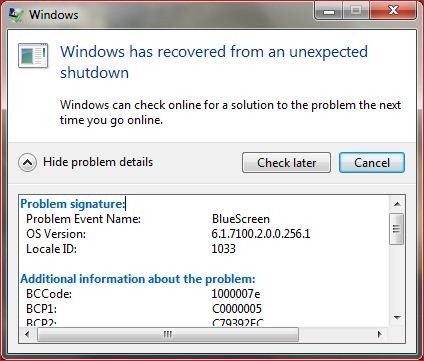 Windows has recovered from an unexpected shutdown. Windows can check online for a solution to the problem the next time you go online. Wow, superb. The time this error window was presented my machine was still connected to internet but it says the next time you go online…. he hee. I must admit that I have never seen a BlueScreen on my this machine in Windows Vista but now Windows 7 loves the BlueScreen. Sometimes later, I shall include more hanged information about Windows Media Player 12. These error screens on Windows 7 doesn’t mean that Windows7 is not that bad. I love Win7 despite such errors from the Microsoft.